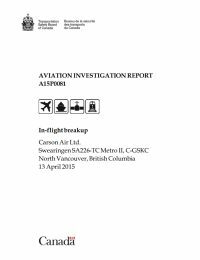 The Carson Air Swearingen SA226-TC Metro II was operating as flight 66, a weekday cargo flight between Vancouver International Airport (CYVR) and Fort St. John (CYXJ), British Columbia, Canada, with planned stops in Prince George (CYXS) and Dawson Creek (CYDQ). On the morning of the occurrence, CA66's first officer arrived at the airport at approximately 06:00. The first officer appeared to be in good spirits and spent about 5 minutes in the flight planning room before going to the aircraft to prepare it for that day's flights. The captain arrived at approximately 06:15 and went directly to the flight planning room to begin preparing the morning's flight plan. He appeared to be in a positive state of mind and spent a few minutes speaking with other company pilots who were also preparing to operate flights. He used a company computer to access weather information and placed a telephone call to NAV CANADA to file an instrument flight rules flight plan. No abnormal behaviour was observed by anyone with whom he had contact. The captain then walked to the aircraft and spent about 10 minutes in the flight deck before assisting the first officer with loading the flight's cargo. Final flight preparations were carried out by both flight crew members before they boarded the aircraft and started the engines, at about 06:45. At 07:03, CA66 began its take-off run. The aircraft lifted off after an approximate ground-run distance of 2800 to 3000 feet. This was within the expected normal performance for the aircraft type. Shortly after takeoff, CA66 contacted CYVR terminal departure control and was cleared to 9000 feet above sea level (ASL). A short time later, the air traffic controller assigned the flight a northbound heading. At 07:07, CYVR terminal departure control instructed CA66 to change radio frequencies and contact CYVR centre control. Upon initial contact with CYVR centre control, while climbing through 7500 feet, CA66 was again cleared to the aircraft's final flight planned altitude of flight level 200. At 07:08, the crew acknowledged a clearance to climb to flight level 200; this was CA66's last radio transmission. One minute and 20 seconds later, while climbing through an altitude of 8700 feet on an assigned heading of 350° magnetic, the aircraft disappeared from secondary surveillance radar displays at air traffic control. CA66's radar track, from the time it first became visible on radar at 07:02 until a steep descent toward ground, was approximately 7 minutes. The track showed an apparently routine climb from CYVR, at an average climb rate of 1500 feet per minute. Aircraft speed during the climb increased gradually until a ground speed of approximately 185 knots was reached. The last 3 radar returns from CA66 showed the aircraft beginning an abrupt, steep descent. At 07:09, a radar return showed that the aircraft was at 8700 feet; this was the highest altitude it reached. The 2 subsequent radar returns showed that the aircraft had dropped rapidly to 7600 feet and then 5000 feet while continuing in the direction of flight. There were no further returns. During the initial stage of the descent, the aircraft pitched down at about 6° per second, and its vertical acceleration reached -0.6g. The descent to 5000 feet likely occurred within 10 to 14 seconds. During that period, the aircraft's descent rate exceeded 30 000 feet per minute, and aerodynamic forces caused structural disintegration of the aircraft (in-flight breakup). There was no Mayday call or other communication from the aircraft during this period. Deteriorating weather conditions with low cloud and heavy snowfall hampered an air search; however, aircraft wreckage was found on steep, mountainous, snow-covered terrain by ground searchers at approximately 16:45. Both pilots had been fatally injured. Investigation showed that the captain had 0.24% blood alcohol content [BAC]. To obtain this, the captain would have had to consume approximately 17 to 20 standard drinks over a 12-hour period. An autopsy also identified focal severe coronary artery atherosclerosis and both steatosis and hepatitis in the captain’s liver. Finding these conditions in a 34-year-old person suggests excessive alcohol consumption over a significant period. The captain had recently applied for the position of Vancouver base chief pilot for the company’s cargo operation. On 26 March 2015, the company advised him that the position had been awarded to another candidate. Around the same period, on 24 March 2015, 20 days before this accident, a first officer who had been having symptoms of depression and psychosis deliberately flew a Germanwings Airbus A320 into terrain, killing all on board. Although there were several coincidental factors, the investigation could not make any conclusions about the captain’s predisposition to committing an intentional act. Other scenario's like pitot system blockage or crew incapacitation were also considered, but deemed not very probable. 1. For unknown reasons, the aircraft descended in the direction of flight at high speed until it exceeded its structural limits, leading to an in-flight breakup. 2. Based on the captain's blood alcohol content, alcohol intoxication almost certainly played a role in the events leading up to the accident. The Department of Transport, in collaboration with the Canadian aviation industry and employee representatives, develop and implement requirements for a comprehensive substance abuse program, including drug and alcohol testing, to reduce the risk of impairment of persons while engaged in safety-sensitive functions. These requirements should consider and balance the need to incorporate human rights principles in the Canadian Human Rights Act with the responsibility to protect public safety. 5 April 1986 N61Z Britt Airways Bird strikes on short final Cape Girardeau, MO. Both engines replaced due to damage. Distance from Vancouver International Airport, BC to Prince George Airport, BC as the crow flies is 520 km (325 miles).